This is my first tutorial on Salesforce and in this tutorial we are going to learn how we can setup Open CTI sample application provided by Salesforce. Salesforce has provided a nice tutorial on this but still some developers face challenges to set this up. I would suggest you to follow this tutorial in your developer org. As this doesn't require coding or programming skills, any SFDC Administrator and Developer can follow this. We will cover how to customize call center settings in my upcoming tutorials. To install demo Open CTI adapter please click on the below link. This will ask you Salesforce credentials. Please note you can install this to your company sandbox also if you have admin privileges but I would recommend you to use developer account as you will have full access. This is a link to Salesforce Demo Open CTI Adapter. You will see below screen if you provide valid user name and password. This screen gives details about what are the components its going to create. Once you reviewd it you can click on “Continue” button. There is not much to do on this page, click on “Next” to continue. Accept the default option selected on this page. Only admin users will have access to this package. 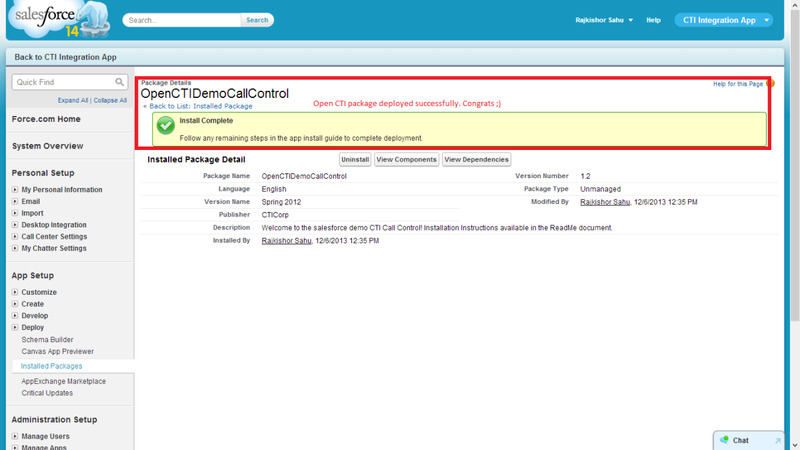 This is the final confirmation page before installation of “Demo Open CTI adapter” package begins. 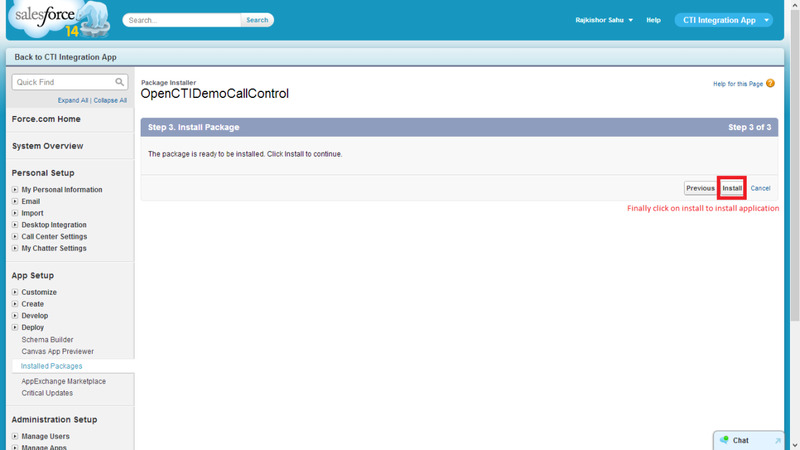 Click on “Install” button and Saleforce will take care of “Demo Open CTI adapter” package installation. 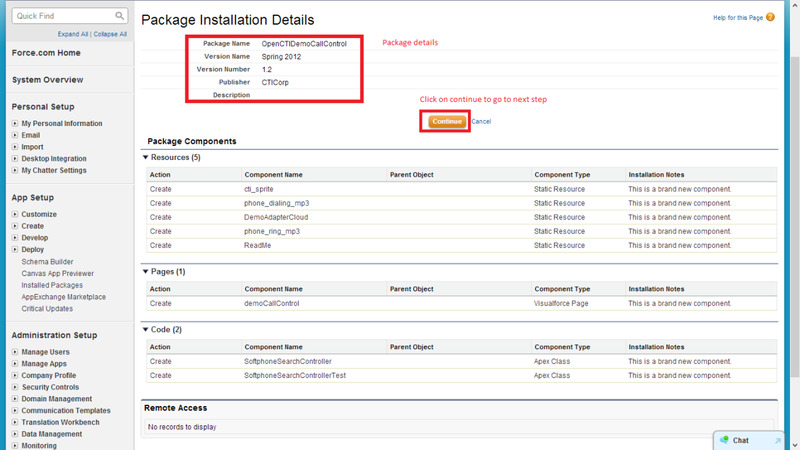 You will get below page if package installed successfully in your Org. Next we have to do some configuration to see this application in action. Next go to “Static Resources” or in “Quick Find” search box type “Static Resources” and then select “Static Resource”. In “Static Resources” select “DemoAdapterCloud” resource as highlighted in below screen shot. This is an XML file and this file is required in “Call Center” settings. Click on “View file” to open XML file. Once XML file is opened, press “Ctrl + S” to save it on your computer. We will upload this file to SFDC to setup soft phone. This file contains all the required information Soft Phone requires to run properly. 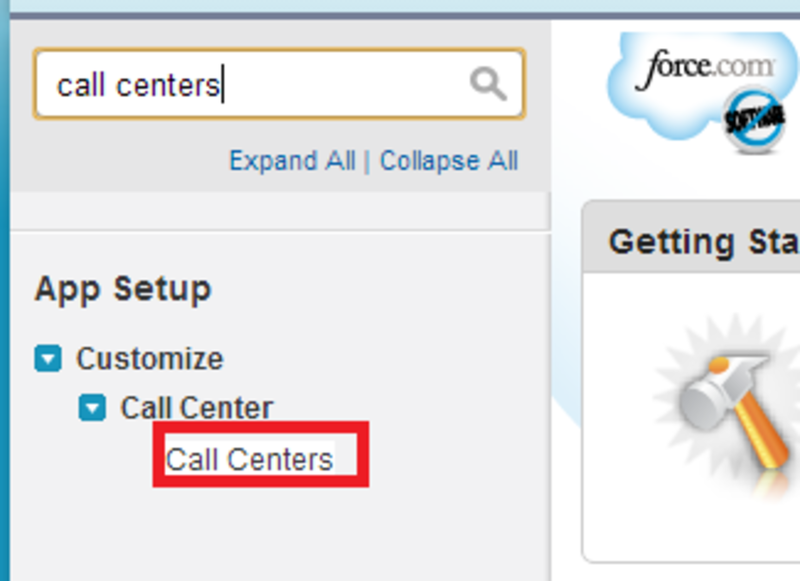 Now quickly navigate to “Call Centers” from quick find box. Click on “Import” button. Here you have to select XML file (DemoAdapterCloud.xml) which we downloaded from SFDC Static Resources and then click on Import button. If XML file is valid then you can see below information. This is the minimum information required for soft phone to work. 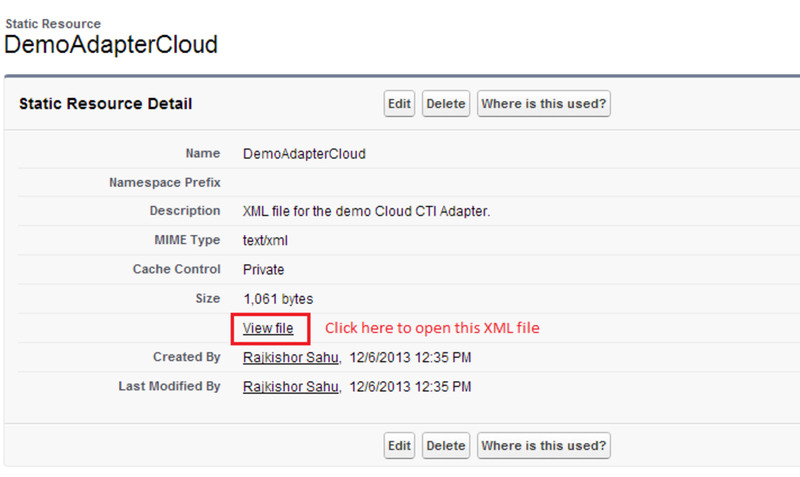 You can customize the XML file and upload to add more information here. 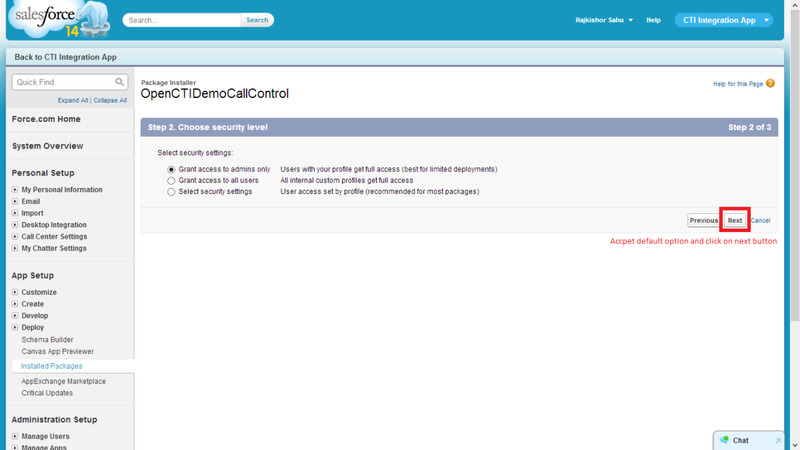 In order to see Demo CTI Adapter on Salesforce UI we have to update “CTI Adapter URL” to currently used domain. To do so check your Salesforce URL. For me its “ap1.salesforce.com” because I am accessing SFDC from India and this could be different for you. Now update “CTI Adapter URL” to your instance. 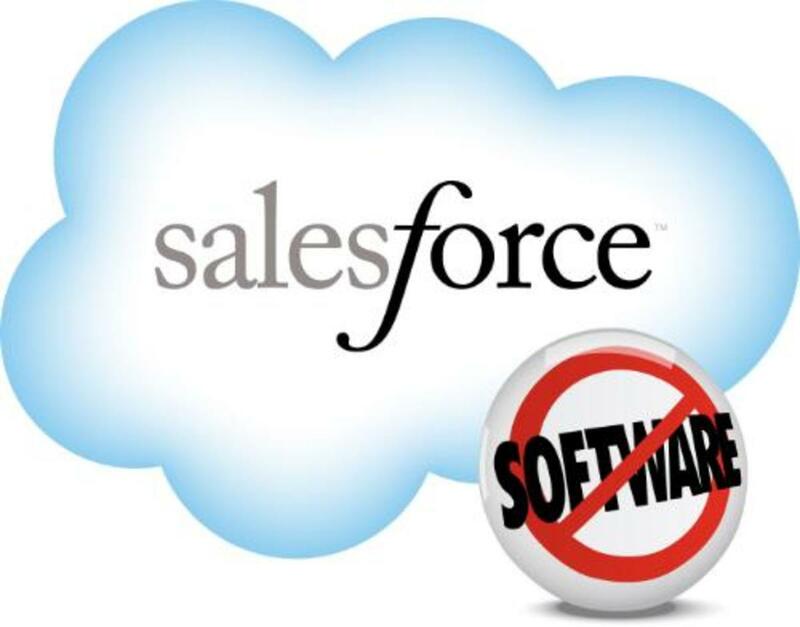 In my case I updated the URL from “https://c.na6.visual.force.com/apex/demoCallControl” to “https://ap1.salesforce.com/apex/demoCallControl” because my SFDC instance was “ap1.salesforce.com”. Next step is to add users to this “Call Center”. Please note that, soft phone will be visible to those users whom we assign to “Call Center” settings. 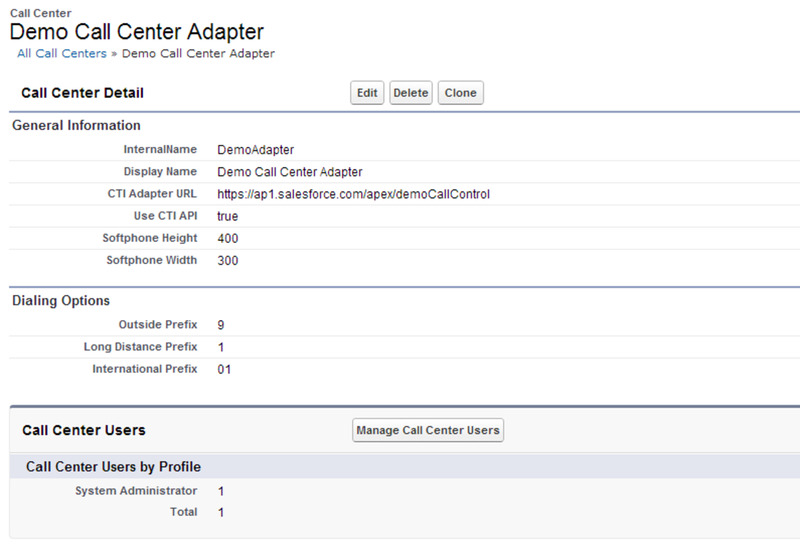 To add user click on “Manage Call Center Users” as shown in screen shot. 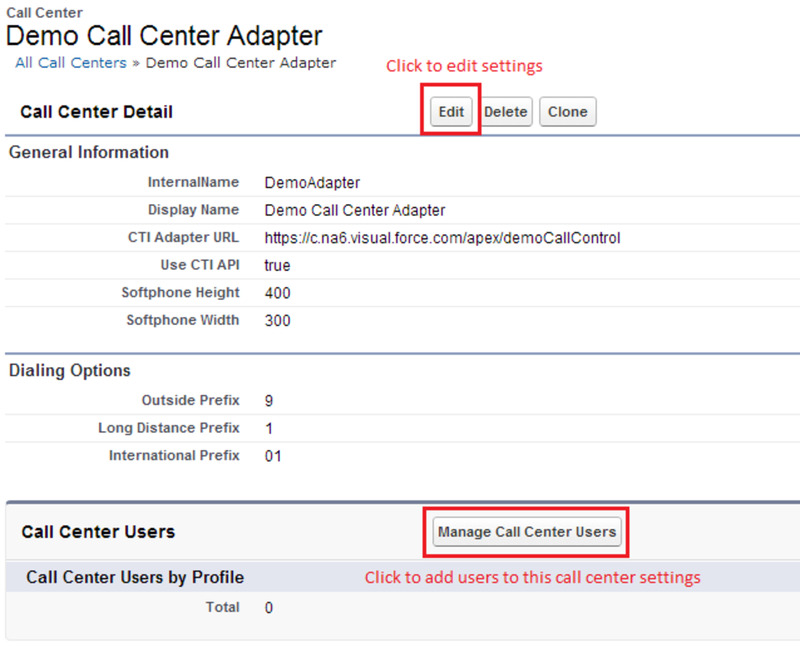 Follow the simple steps to add Admin users, you can see list of users assigned to “Call Center”. Now click on “Home” tab to see soft phone in action. Did this help you to setup Salesforce Demo Adapter? Change virtual memory on windows to get performance boost. @Vetriselvan : you can call api function to create task when call is ended. This is a pretty good article. I have a problem here. When the call gets ended the activity is not logged. 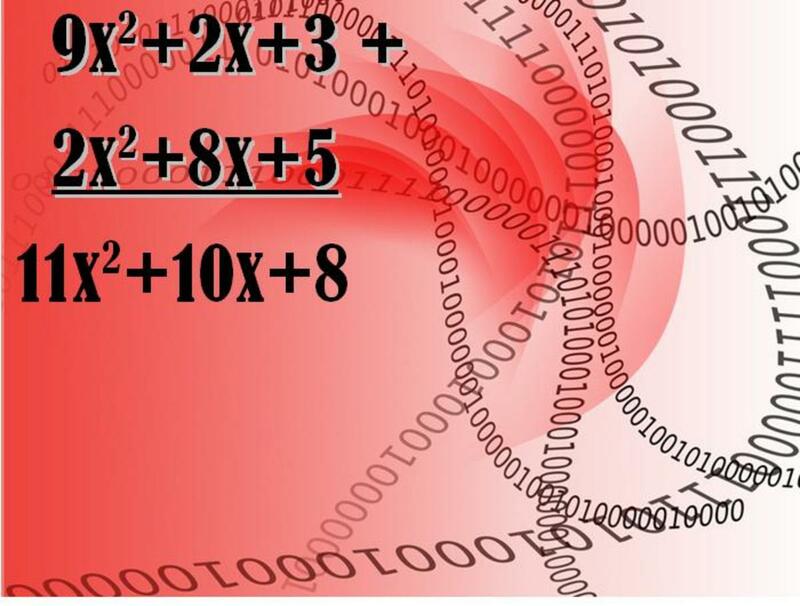 any configurations? How can i get the saved call logs? Can you please provide me new package. @murali : which dialer infrastructure your organization own? We have genesys and avaya setup and we built softphone for Genesys dialer. I didn't get any break through to make call, When I load softphone in an Iframe, Please could you help me if you have hands on on this. @Murali Krishna : its demo softphone which will not work out of the box. 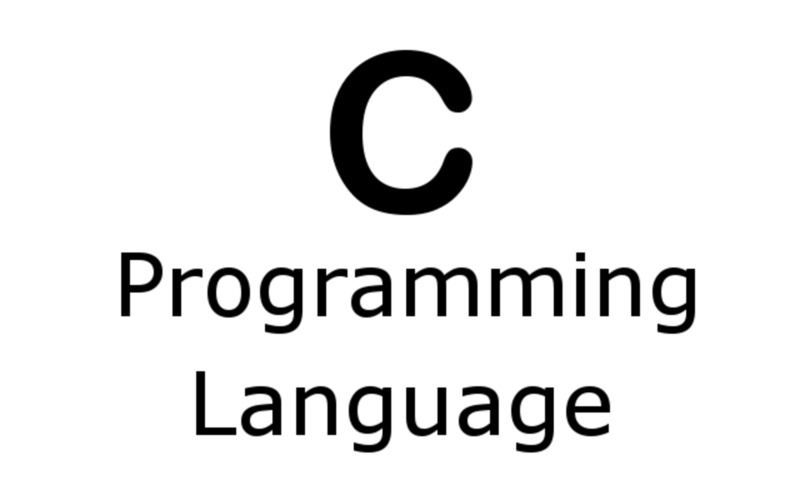 It has basic stuff to start your development. 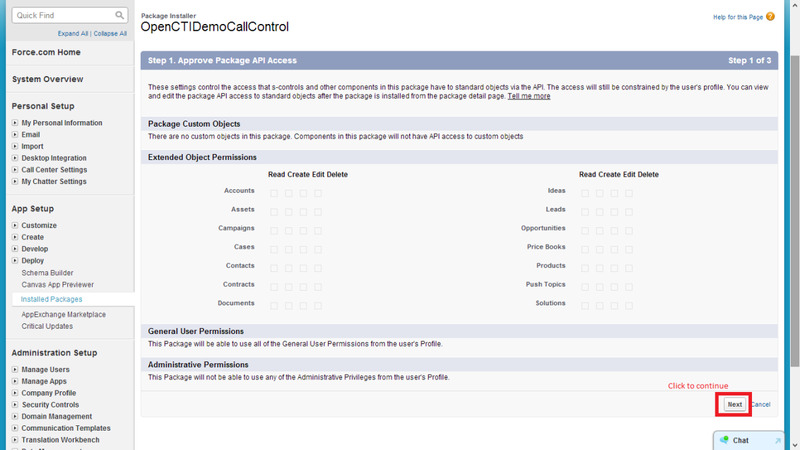 I would recommend you to go through Open CTI api guide and demoCallControl visualforce page if you have installed that package. I tried by loading softphone adopter URL in Iframe. But when I make a call using “sendCTIMessage” with appropriate parameters including phone number it is not working. Can you please help me in this regard. @murali : You can read your softphone settings in VF page and load softphone in iFrame. How I can see the soft phone on my custom pages. It is only showing on salesforce layouts.